At Haden Freeman we try to engage with our clients in the most cost effective and appropriate way. For some that may be entering into an alliance partnership, where we can provide resource in a flexible manner, for others we focus on a project, with a defined start and finish date and a set budget. We work with partners, to ensure we can provide a comprehensive set of services, ensuring the right expertise for the job. Our work is located both within the UK and across Europe and the rest of the world. Haden Freeman has formed a number of successful alliance partnerships with leading organisations from a broad range of process industries. Working hand in hand in this way has led to mutual successes for all parties, delivering key benefits such as reduced project costs, increased profitability and optimised operations. Combining the skills and resources of our alliance partners with our process industry expertise and flexible internal structure enables us to provide a truly unique service. We bend and flex to meet the requirements of an alliance arrangement, working on a project basis or ad-hoc as required. Those with whom we have alliance agreements experience an easy non-confrontational execution of our services and enjoy value for money and discounted rates. Operating within the alliance includes an open book policy, so all costs are known. Equally there are personnel who are familiar with the site working within a stable, long term relationship. The Alliance Manager will often meet with other HFL Alliance Managers, discussing opportunities to develop the service, sharing experiences and information and ensuring that the relationship has the best chance for success. Additionally, we are able to call on other group services e.g. HFL Risk Services, should there be a requirement for regulatory compliance or picme®, our business process improvement consultancy. Haden Freeman management specialists direct projects from start to finish, taking on full responsibility for their completion and success. Our responsiveness and efficiency are key factors in keeping the project running smoothly. 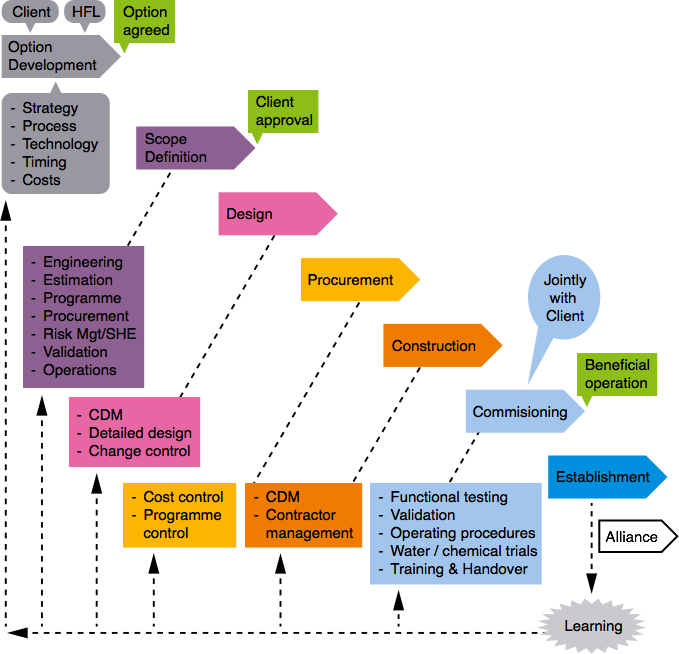 We have developed a tried and tested project methodology that can be successfully applied to all projects, ranging in size from a few thousand pounds up to £50 million. We offer unrestricted access to the expertise of our senior management team which means that enquiry response times are minimised. Combined with less red tape and bureaucracy and increased stability of staffing, our clients are able to benefit from all aspects of our management service. Addressing all construction aspects is an important part of the project. Site preparation, permit approval, CDM, safety and methodology are all planned meticulously. The effective execution of each stage in the cycle ensures that projects are completed on time, on budget and with better results. Haden Freeman has developed a number of successful operating partnerships with suppliers in our various technical areas of expertise. By having a close working relationship with our suppliers, it is possible to minimise unnecessary bidding procedures, provide quality at competitive prices and ensure client projects come in on time and within budget. Where our partners offer different but complementary services, we have formed a number of business partnerships. Our joint capabilities provide clients with a higher degree of expertise via a seamless service and a single source of responsibility. Successful partners share compatible business strategies to those of Haden Freeman, operate in similar industry sectors and are committed to sharing knowledge and learning from Haden Freeman and from each other. Haden Freeman has an excellent reputation for enabling our clients to execute projects in overseas locations, ensuring technical excellence and project certainty. Working hand in hand with our overseas alliance partners, we are able to provide specific local knowledge and support combined with the technical and commercial backup of the Haden Freeman Group. This includes feasibility and market studies, technical adjudication and investigation of references. We also offer advice on contract frameworks, negotiation with local partners and subcontractors, chairing HAZOPs and expert witness in disputes. Often, clients from the USA or Europe wish to replicate a western facility in lower-cost countries. Haden Freeman works with these clients to define process and engineering requirements and to develop an outline engineering package for detailing and localisation in the country of construction. We also provide technical supervision for local construction and assistance with start-up and commissioning. Working with carefully-chosen local partners, Haden Freeman offers the peace of mind of a guaranteed maximum price project execution in virtually any country in the world. We have worked on projects across the globe including the following countries: Australia, Belgium, Bulgaria, Canada, China, France, Germany, Ireland, Italy, Poland, Qatar, Romania, Russia, Saudi Arabia, Serbia, South Korea, South Africa & Thailand. Our clients include the Saudi Industrial Development Fund, Thai Petrochemical Industries Corp, Baker Hughes International, Proctor and Gamble, The Nalco Co., Nufarm Ltd, Actavis and Virolite.